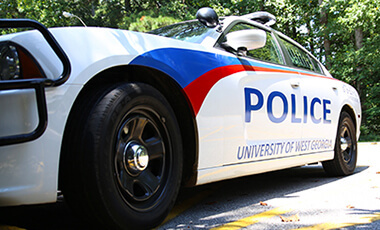 A proactive safety technology implemented by the University of West Georgia to detect and notify law enforcement of gunfire is scheduled for a live test the evening of Thursday, Oct. 4. Known as ShotSpotter, the system is gunshot detection technology that uses sophisticated acoustic sensors to detect, locate and alert law enforcement agencies about illegal gunfire incidents in real-time. This empowers authorities to respond faster and more safely. 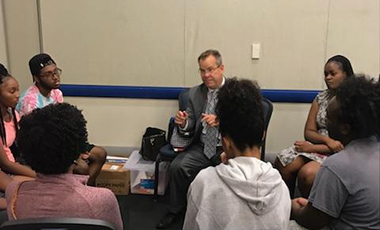 A group of nearly 300 students shared courageous conversations with local law enforcement at the University of West Georgia recently during the academic year's first Blue Mocktail Townhall event. 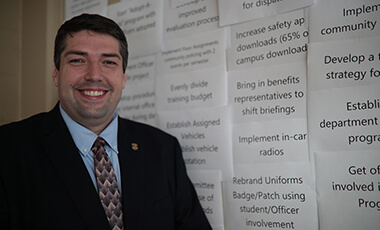 Thirty-five sheets of computer paper blanket one wall of University of West Georgia Police Chief Tom Saccenti's office. The pages - the each bearing a short description of a program members of his force would like to see enacted - overlap each other, creating a patchwork of initiatives, ideas and new technologies. Tyler McArthur was looking for a school to attend after finishing two years at Georgia Highlands College. After visiting UWG and several other Georgia schools, the Rome, Ga., native found the right fit at UWG. 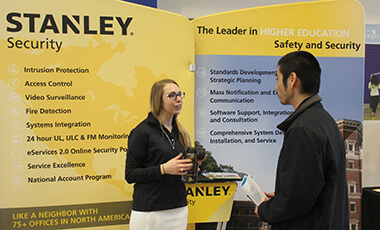 With personal and campus security emerging as a topic of conversation among students and residents in college towns across the country, the University of West Georgia and Stanley Black and Decker are joining forces for their second safety summit and career event Sept. 8-9.